This small bathroom in an older Craftsman style home was gutted back to the studs. In preparation for the tile work the walls and floor were significantly repaired, leveled and plumbed. 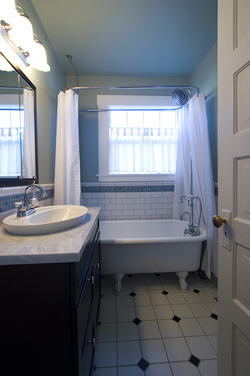 The cast iron clawfoot tub was removed to the garage where a subcontractor applied an epoxy refinish. All the plumbing and electrical was redone. 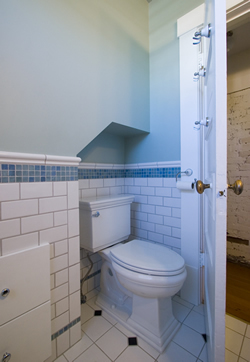 A new low flow toilet was selected to match the style of the period. The major subcontractor for the job was the tile setter, who also fabricated and polished the new marble countertop. A set of new drawers, passing under the adjoining staircase, give the small room some much needed storage. The walls were finished smooth, which is much closer in appearance to the common paint-over-wallpaper look of older homes than is a modern “orange peal” texture.